THIS RESTAURANT HAS CHANGED LOCATIONS. Handsome Euro-Cal bistro inside South Coast Plaza offers seasonal cuisine by husband-wife duo Florent and Amelia Marneau. • Go behind the scenes of Marché Moderne! Watch our exclusive interview with pastry chef Amelia Marneau. 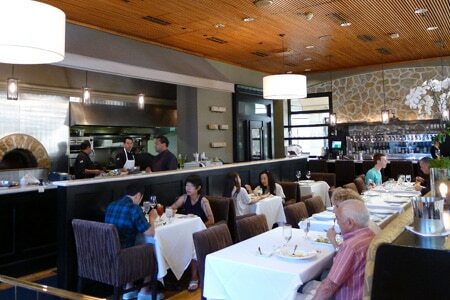 : MARCHÉ MODERNE HAS MOVED TO A NEW LOCATION AT CRYSTAL COVE SHOPPING CENTER, 7862 E. COAST HWY., NEWPORT BEACH. Costa Mesa’s South Coast Plaza is a draw not only for its shopping opportunities but also for its culinary roster. Chief among them is Marché Moderne, the culmination of the illustrious careers of chefs Florent and Amelia Marneau. The sophisticated yet inviting interior features wood plank floors, high wood ceilings, cozy banquette seating, sumptuous fabrics and an exhibition kitchen. However, the patio may be the jewel of the restaurant, with Mediterranean touches like olive trees, a communal table and romantic booths for four draped with silk taffeta. OC’s power elite, especially head honchos and fashionistas, lunch here on the chef’s three-course fixed-price menu ($25). In the afternoons and early evenings, some come here to relax at the wine tasting bar with its temperature controlled Cruvinet dispensing system. Chef Florent is also known for his fresh salads (burrata and heirloom tomatoes, salade composée) and savory, French-style tarts, which he bakes himself in the kitchen’s roaring wood-burning oven. Other starters might range from pork belly confit with peach and red onion jam to roasted octopus flavored with chorizo, shishito pepper pipérade and sauce verte. There’s a good selection of French bistro classics such as cold foie gras torchon, steak frites, coq au vin and charcuterie. Entrées, like the soft-shell crab with yuzu emulsion served alongside a shower of black truffles, are full of enticing flavors. Be sure to make a few selections from the cheese offerings, which mostly hail from France. The crowning course may be one of pastry chef Amelia’s creations, perhaps peach gâteau with late-harvest Semillon ice cream and praline cream.